The Marble Mountains, eight kilometers southeast of downtown Danang, rise above the sandy beach of Hoa Khue village. There are five peaks named after the five basic elements in Eastern philosophy – metal, wood, water, fire, and earth. They look like a god’s hand when seen from above, suggesting that this is a holy land. Legend says that an old fisherman, who lived on the Danang coast, suddenly saw a dragon emerging from the water to lay an egg. After the dragon had disappeared back into the water, a golden turtle, who claimed to be a god named Kim Quy, came and dug a hole in which to bury the egg. The turtle gave the fisherman one toenail and instructed him to protect the dragon egg from hawks and other predators. The dragon egg hatched a beautiful girl and the eggshell broke into five pieces, which turned into the five Marble Mountains. 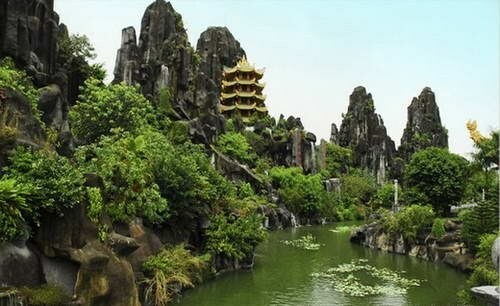 The Marble Mountains today are a nature reserve sheltering historical relics with a spiritual dimension. The sounds of wind and wooden bells, the fragrance of incense, and the transitory mountain shadows make visitors feel a deep peace in their souls. British visitor Ali Collier said, "The caves at the Marble Mountains are really stunning and special. I love this place and I want to know more about its. history and culture. I will definitely come back." 90 engravings in the ancient Vietnamese Chinese characters are being kept in the caves of the Marble Mountains, where there are also eight Buddhist inscriptions of the Nguyen dynasty on the cave walls. According to Venerable Thich Khong Nhien of the Lieu Quan Buddhist Cultural Center, the Marble Mountains have played an important role in the development of Buddhism in the Quang Nam–Danang region. During Vietnam’s resistance wars, this area sheltered soldiers and civilians from Quang Nam province and Danang city. The site welcomed 2 million visitors last year and last December, it was recognized as a special national relic. Since 1990 when the Marble Mountains received national relic status, the Danang authorities have created in a master plan for managing and preserving the site’s tangible and intangible heritages.